I was recently in Los Angeles attending a business mastermind retreat with my mentor Eli Davidson. She asked us to each bring something with us that reflected our greatness, qualities we admired, something unbreakable. Then we got to do a show and tell with our colleagues at the retreat. My special something was my blue scarab pet rock. Many years ago, I found this really cool rock on an adventure walk about. It was a roundish, grey river rock and it had a very nice energy to it. Later on I decided to paint it according to my fancy. And of course, as you can see, the little pet rock family has expanded with 2 ladybugs and a salmon colored scarab! Scarabs were treasured, even worshipped in Egypt, due to their ability to take dung and fertilize the ground with it, from which came the bountiful harvests Egypt depended on. In class, the first point I made about my special rock was that the scarab was an inspiration to me, demonstrating the ability to turn the trash, pain, disappointment, so-called waste of our lives into treasure, life changing experiences, the very fertilizer needed for the soul to grow, heal and become prosperous and abundant. The second point I made was about the ability to transform the ordinary into the extraordinary. Rocks are all around us, we often don’t even see them as we walk our path. I find them extraordinary and have even had conversations with rocks that were astonishing. I encourage you to take a moment to experience the world around you in a new different way. Try this: Close your eyes, relax, breathe deeply, let your mind be quiet. Let go of any distractions, tensions, worries or concerns for just this one moment in time. Center yourself, feel your love for animals, connect with your appreciation and admiration for all of nature. Let yourself feel a deep sense of gratitude. Take an everyday something you normally wouldn’t notice much. You might even take it for granted, completely overlooking it’s brilliance. Consciously choose to connect with it in a new way. Shift your focus, tune in and connect. Feel the energy, the spiritual essence, the life force inherent in the beings, objects, the forms surrounding you. Let yourself come into close communion with it, whether it’s an animal, a bird, a plant, tree or even a rock or a building. Try asking a question. What would you most like help with? If you could tap into their knowledge, experience and wisdom, what would you most love to know about? Let yourself imagine a dialogue between you. Ask questions and listen carefully for the reply. If those beings, objects or forms chose to speak with you, if they had a message to share with you… what would it be? The response could be a flash of image, a feeling, a thought, a concept, a gut knowing. When you do it right, the experience can literally be an epiphany, life changing moment, a small hinge that can open an enormous door. Think that’s pretty far out there? Maybe it is, but you won’t know what you don’t know until you try it. There is energy, wisdom and sentience in everything around you. Humans haven’t cornered the market on intelligence! Remember other species have voices, feelings, wisdom and divine Spirits just like we do. Animals need you to be able to hear them, to recognize, respect and revere them for the Angels, Teachers, Healers and Guides they truly are. Ultimately they can be your best teachers when you know how to tune in, listen and learn from them. P.S. 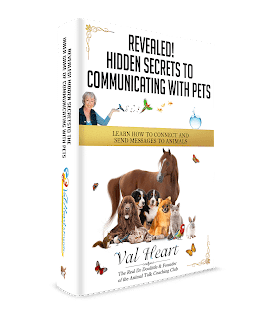 Ready to learn more about communicating with animals? If you’ve taken the FREE QuickStart to Animal Talk course, then you’re eligible to join the exclusive Animal Talk Coaching Club! Or, you can really dive in with the How to Talk to Animals Beginning Core Foundations Course! © Copyright, Val Heart & Friends LLC. All Rights Reserved.